Our Estate swing and slide gates are constructed of industrial strength aluminum to provide security and safety. These electrically operated gates are available with numerous accessories and designs, or can be custom constructed to ensure your satisfaction. 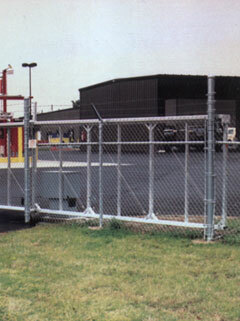 Fortress Heavy Duty Slide Gate: Manufactured by Tymetal Corp., this gate features a cantilever system consisting of single or multiple panels. Designed to provide rigidity and stability, the frame is supported from the track of extruded aluminum alloy by two self-aligning, 4-wheeled, sealed lubricant, ball bearing truck assemblies. The bottoms of the support posts are equipped with two pairs of rubber glide wheels. These heavy-duty gates provide a versatile, stable solution for protecting commercial landscapes. The gate allows companies to have an easy, elegant way to control who enters their property. The high-quality aluminum gives the gate the strength required by companies to protect the business. With the ball bearing truck assemblies, the gate is also equipped for fast opening and closing.